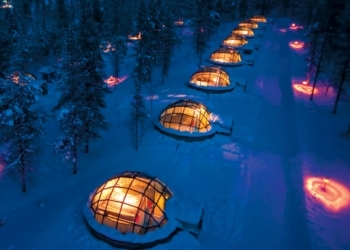 In winter, from December until April, in the close proximity to Hotel Kakslauttanen is the famous Igloo Village. In the Igloo Village there are 20 Snow Igloos for sleeping and an Ice Gallery, Bar made of Ice, Ice Chapel that is extremely popular for weddings, and World's Largest Snow Restaurant for 150 persons. At the Igloo Village there is also five unique Glass Igloos, which provide a unique opportunity to sleep under the Lapp sky admiring the northern lights in a comfortable room temperature. Imagine yourself sleeping in an Igloo made of Snow. It is totally quiet. Lights inside ice illuminate the Igloo. These make the atmosphere so exciting that never get bored of marvelling it, until you fall to deep, comfortable sleep in your warm down sleeping bag. Besides warm (extremely temp. -32C) down sleeping bag, we provide you woollen socks and hood. The temperature inside Snow Igloo stays always between -3c and -6c so that you will never feel cold. That's a promise! The snow Igloos are for 1-5 persons. After the night in an Igloo it is time for a Sauna. The saunas and showers next to the Igloo Village are open every morning. From the sauna it is also possible to dip to a hole in the ice in the river. What a way to start your day. After years of development, which was based to our wild idea and vision, we were finally able to finish the unique Glass Igloos in our Igloo Village. When sleeping in the Glass Igloos the customer is able to marvel the amazing northern lights and the millions of stars in the sky. The experience is also unforgettable when there is a snowstorm. Kakslauttanen is a very good place for seeing the Northern Lights, Aurora Borealis, as in the area there are not so many electric lights outside and it is north enough so that the probability of them is very high from late August to late April. The Glass Igloos have been built from a very special thermo glass. Because of that, the temperature inside the Igloo is always a normal room temperature. It also prevents the glass from not getting white frosted, hence keeping the view clear even when the temperature drops under -30 C. To increase the comfort of the customer, the Igloos have a toilet and luxury beds. Every morning there is also a sauna and a possibility to swim in an ice hole nearby. Glass Kota is a heated building in the shape of a traditional Lapp teepee where guests at the Igloo Village can admire the Northern Lights. When the temperature drops and the snow begins to whirl, this is an ideal place for a cocktail party, which is 8 metres high and 8 metres wide. 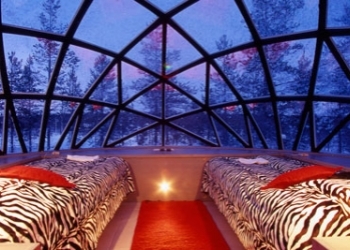 It is made of thermal glass to allow a beautiful view of the sky and nature in Lapland. Every year the best ice sculptors of the world come to Kakslauttanen to participate to the international ice-sculpting week. Ice-sculpting event takes place at the Ice Gallery and Igloo Village every year in December and the results of the weeks can be seen rest of the winter in our Ice Gallery. For our guests it is also possible to try ice or snow sculpting. This is an exciting way to find an artist within you and with our instructor everybody will be able to make very beautiful sculptures. Because our huge ice storage room Ice Sculpting is also possible in the summer! We also make Ice and Snow Sculptures by request to the companies or private customers. This is an exciting way of decorating your cottage or seminar. It is truly something special to surprise your guests. After the tour of the Igloo Village or an artistic session it is time to enjoy a plentiful and high quality meal in the unique Snow Restaurant. It is also possible to have just a few drinks from a glasses made of real ice in the Snow Bar made next to the Snow Restaurant.